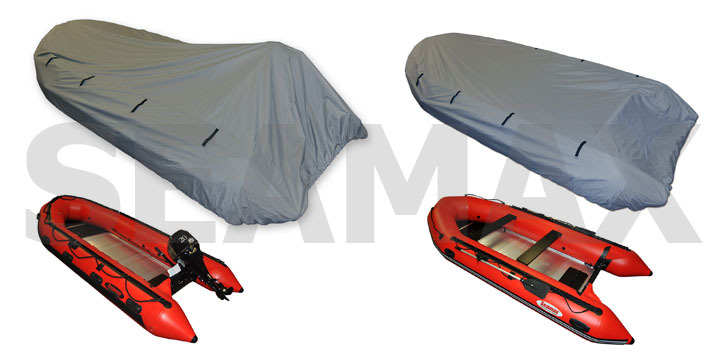 5 SERIES & 22 MODELS: Seamax inflatable boat covers have 5 series. Each series includes a couple of sizes for different tube styles. Those sizes should be the same width. Read the “Model List” below to all our cover sizes. The bow style will not affect the cover size in most cases. 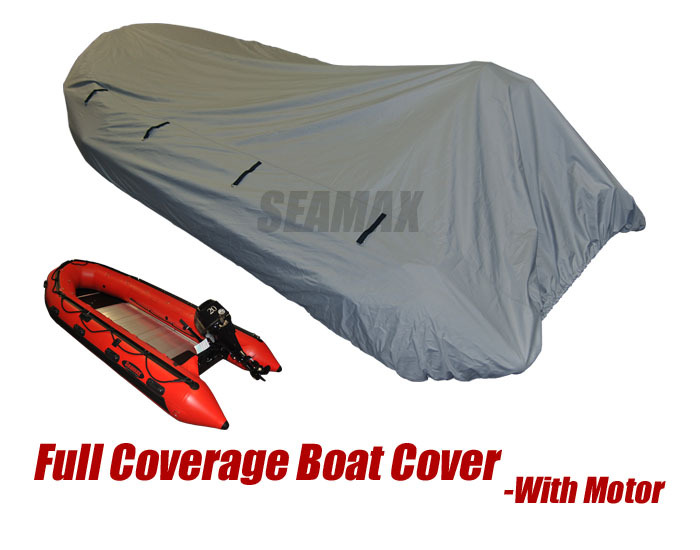 UNIVERSAL COVER: No matter which brand of boat you have, even if it is a RIB with a console, our universal cover should fit as long as your inflatable boat has a built-in transom. If you don’t see a listing for your boat’s measurements, please contact the seller. 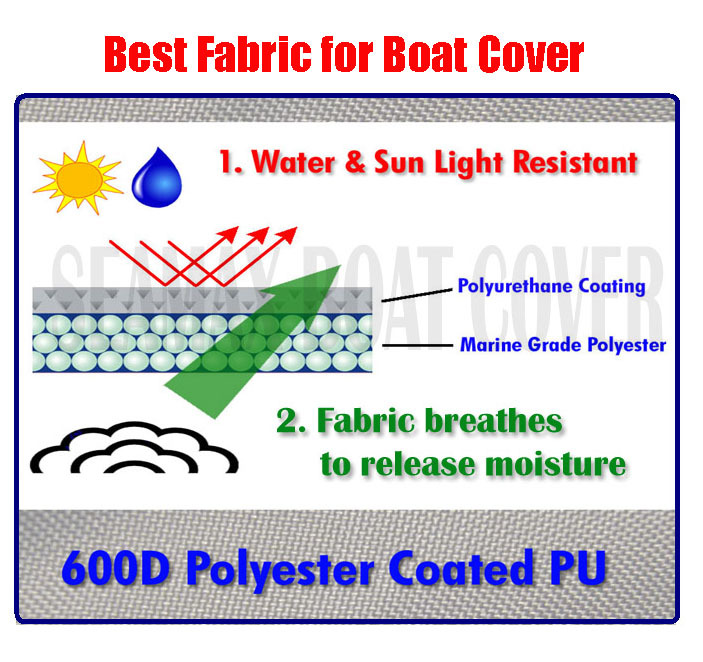 MOTOR WELL DESIGN: Our boat cover should be able to cover your boat and the motor. Year-round weather conditions and usage are important to selecting the right boat cover and its fabric. The right choice can mean the difference between a boat covered in mildew and one that is just the way you left it every time and go back. 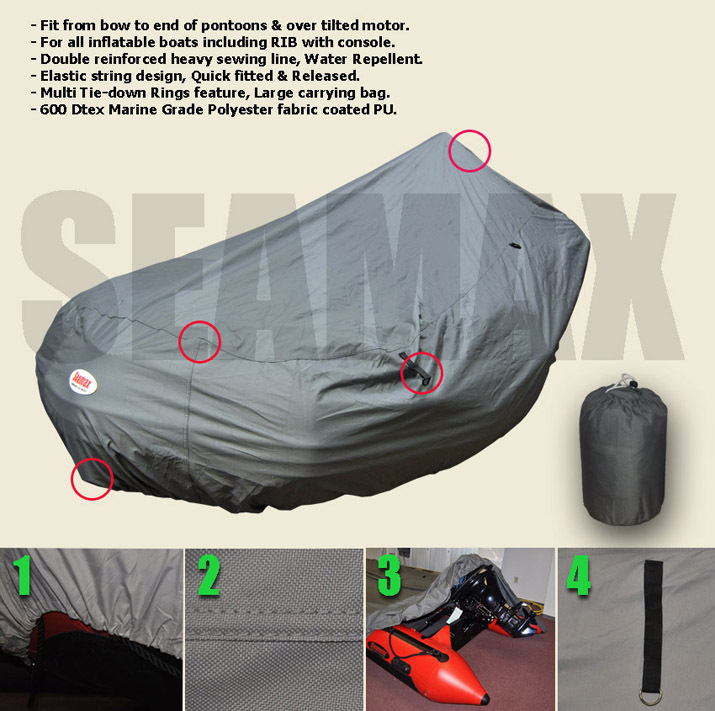 The Seamax boat cover uses Polyurethane coated PU (Polyurethane Coating); the PU layer is on one side of the fabric. This kind of fabric has high strength, durability, water resistant, UV protection, high breathability and good in almost any climate. Selecting the proper boat cover size involves just a few key pieces of information and steps. Follow these tips to ensure you choose the right cover for your inflatable boat. Identify your boat type, make or model. Measure the boat (length and width). To ensure you have the right measurements, be sure to measure your boat as opposed to relying on manuals or other literature. Measure in a straight line (down the center of the boat), Factor in the dimensions of any additional features that will affect the cover such as a trolling motor, center console, jack plate or aftermarket pulpit or anchor davit that is not listed in this manual. Please allow a few inches of additional length to fit that equipment when picking the cover. – If you have a swim step, measure next from the tip of the bow to the back center of your swim platform. This is in addition to the first centerline length because some covers will fit a step and others will not so you will want to have both measurements to ensure the right selection. 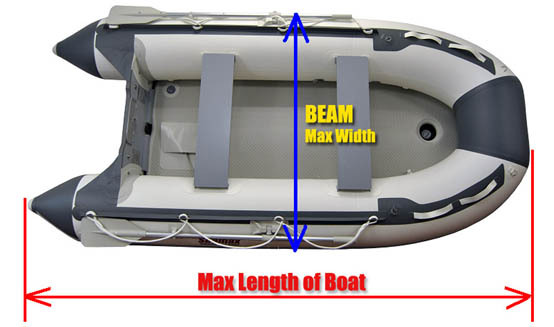 After the boat length and beam width have been determined, you should have some additional information for picking the right cover for your inflatable boat. Cone style and having a center console option will also have to be considered when selecting your boat cover. The most popular cone style is the 90 Degree Pointed Cone. Our boat cover design is based on this cone standard. 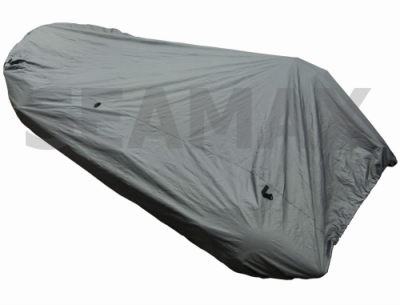 Our boat cover will also fit many other inflatable boats. 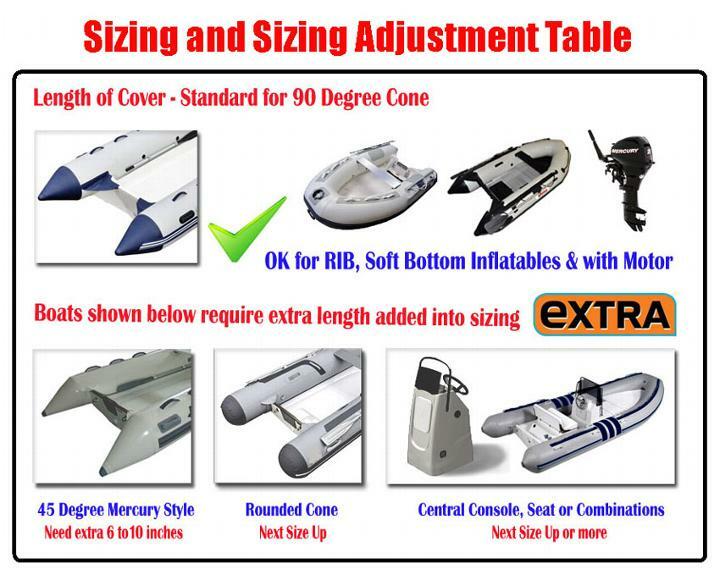 Please see our “Boat Style Instruction Photo” for finding the right size for your boat. STEP 1-2: Locate the boat cover logo and reach the bow side of cover, first to cover the bow of your boat and unroll towards the back. Put the cover open to the sides and cover the pontoon. If using support poles (optional), position the poles under the cover prior to completely covering the boat. STEP 3-4: Pull the Elastic String to cover the cone. If you have a motor, you can put the cover over the motor and then to the other side. STEP 5-6: Adjust the cover by pulling the cover tight to eliminate sagging areas; Adjust the elastic string to get it snug. Always tie boat covers down securely. Avoid allowing water or snow from collecting on your cover. (Tie down accessories & support system is not included in the standard package).